Chile, 2005. Map from World Factbook. 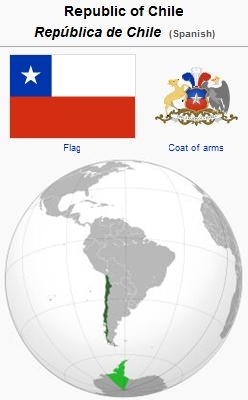 The Republic of Chile is a country in South America occupying a long, narrow coastal strip between the Andes mountains to the east and the Pacific Ocean to the west. It borders Peru to the north, Bolivia to the northeast, and Argentina to the east. In 2009 it had an estimated population of 16,928,873. In 2002, 71% of the population was Roman Catholic and 15% was evangelical. Mennonite work in Chile had its beginning among a group of Chilean refugees in Alberta, Canada. The refugee group had formed a Spanish-speaking Evangelical Church in Edmonton under the leadership of Jorge Vallejos. Vallejos had been the leader of a group in Chile known as Iglesia Evangélica Misionera. As a result of contacts and relationships with Mennonites of the Northwest Mennonite Conference (MC) and specifically with Nancy Hostetler and the Holyrood congregation, the group requested and were accepted as members in the Northwest Mennonite Conference in 1980. In 1981 the Iglesia Evangélica Misionera of Chile requested relationships and official recognition as Mennonites. They also requested that Mennonite Board of Missions (MC; MBM) appoint Keith and Nancy Hostetler as Bible teachers and leadership trainers. After extensive investigation and dialogue the group in Chile was officially recognized as a part of the Mennonite Church by action of the General Board of the Mennonite Church. The Hostetlers were appointed by MBM and arrived in Santiago, Chile, in 1983. In 1984 Donald and Marilyn Brenneman were appointed by the mission board to work in Chile. The group was known as Iglesia Evangélica Menonita, Chile. In 1984 new leadership came into place. The original requests for assistance were altered. It became obvious that theological perspectives and practices and the vision of the leaders of the group were incompatible with the Mennonite Church and MBM. In 1985, following extended deliberation with the group, official relationships were terminated. Mennonite Board of Missions continued to send missionaries to Chile for church planting and related ministries. Following the 1985 earthquake, MBM and Mennonite Central Committee worked cooperatively in relief and reconstruction ministries. Similar assistance took place after the 2010 earthquake. By 2007 there were three Anabaptist-related groups in Chile. The largest was the Unión de Iglesias Evangélicas Bautistas de Chile (UBACH; English: Union of Evangelical Baptist Churches of Chile), an historic Baptist denomination of about 500 congregations and 35,000 baptized members that was rediscovering its Anabaptist roots while strongly claiming its Baptist roots. The 1,200 member Iglesia Evangélica Menonita de Chile emerged from the earlier group of a similar name, and obtained official government recognition in 1990. It requested affiliation in Mennonite World Conference in 2009 and was formally accepted as MWC's 100th member in 2011. The third group was the independent Puerta del Rebaño, an Anabaptist congregation in Concepción (English: Door of the Sheepfold) whose leaders had studied with Titus Guenther at the Comunidad Teológica Evangélica de Chile in the 1990s. Falcón, Rafael. Hispanic Mennonite Church in North America. Scottdale, PA: Herald Press, 1986: 137-38. Gospel Herald (22 October 1985): 737. Mennonite Mission Network. "Iglesia Evangélica Menonita de Chile (IEM)." Web. 27 March 2010. http://old.mennonitemission.net/Work/International/partners.asp?RID=202549&f=print. Mennonite Weekly Review (15 August 1985): 2. Mennonite World Conference. "Mennonite and Brethren in Christ Churches Worldwide, 2009: Latin America & the Caribbean." 2010. Web. 27 March 2010. http://www.mwc-cmm.org/en15/index.php?option=com_content&view=article&id=13&Itemid=16. Mennonite World Conference. World Directory = Directorio mundial = Répertoire mondial 2012: Mennonite, Brethren in Christ and Related Churches = Iglesias Menonitas, de los Hermanos en Cristo y afines = Églises Mennonites, Frères en Christ et Apparentées.Kitchener, ON: Mennonite World Conference, 2012: 19. Greaser, Lawrence H. and Sam Steiner. "Chile." Global Anabaptist Mennonite Encyclopedia Online. June 2013. Web. 18 Apr 2019. http://gameo.org/index.php?title=Chile&oldid=143217. Greaser, Lawrence H. and Sam Steiner. (June 2013). Chile. Global Anabaptist Mennonite Encyclopedia Online. Retrieved 18 April 2019, from http://gameo.org/index.php?title=Chile&oldid=143217. Adapted by permission of Herald Press, Harrisonburg, Virginia, from Mennonite Encyclopedia, Vol. 5, pp. 141-142. All rights reserved.